We see how this works — cups go in the cupholders! Until this moment, eating in the car has been a complete and total disaster: Where do you put the food? Why is there no table? How is a reasonable person supposed to feel confident operating heavy machinery and munching without solutions to these problems?!? Luckily, KFC has found a way to quiet the masses clamoring to be free of all fetters whilst dining en vehicle: Snack containers that fit in your cup holder. I know, your mind is totally and completely blown. KFC was expecting this, because heretofore the only things in cup holders were not pieces of chicken you could eat — more like change, your phone, a handful of pistachios you meant to eat later and then forgot about. But now there’s a solution, and it seems KFC is expecting a food revolution. According to KFC’s infographic (via FoodBeast): 42% of Americans would be more likely to eat in their cars if the food container could fit in their cup holder. And what’s more, KFC knows who is probably doing the eating — for millennials ages 18-32, that could be 53% of people, if they had such a miraculous device in place. 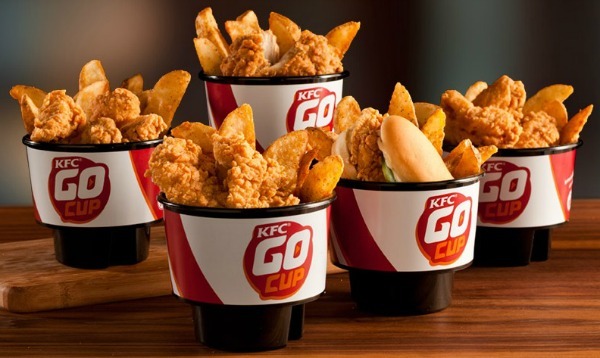 Go Cups will come with one of five choices, paired with seasoned potato wedges for $2.49: Original Recipe Boneless chicken, a Chicken Little sandwich, two Extra Crispy Tenders, three Hot Wings or four Original Recipe Bites. Everything is going to change. EVERYTHING. Either that, or you’ll keep eating fast food out of the bag it came in and wiping your hands on your pants. Whatever.